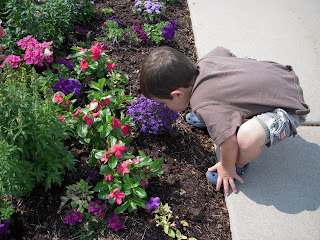 Hudson loves to smell flowers real or fake. Every time he does he sneezes! Funny boy! 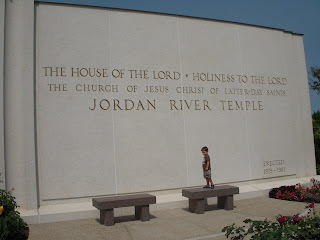 We took Hudson to see the Jordan River Temple. 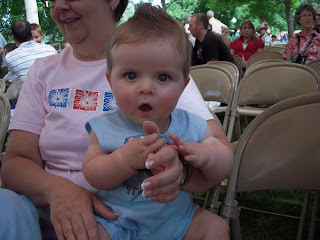 When we moved to Puerto Rico Hudson learned the primary song and started to about the temple. 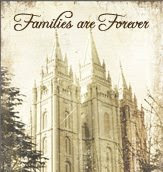 He would notice the picture of me and Travis in front of the Salt Lake Temple on our wedding day. 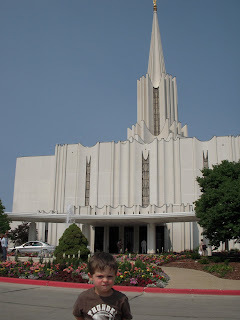 He thought it was pretty cool to see it in person. 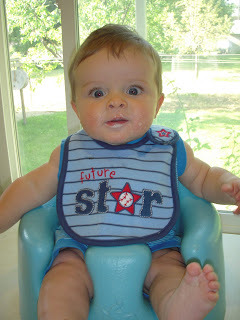 I gave Remy Rice cereal for the first time while we were in Utah! 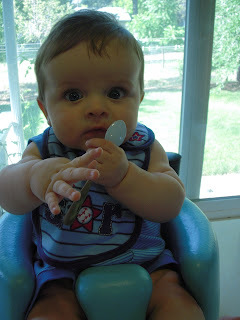 He liked the spoon a lot more. I think more ended up on his face than in his mouth! 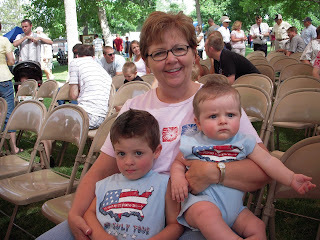 Grandma Ging with the boys at the park! I love this picture of Remy going in for the kill! He is trying to chew on her finger! McCoy! 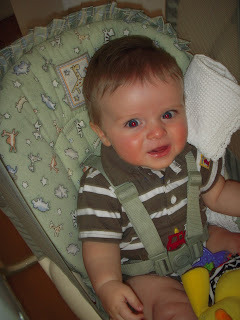 this is my nephew the cutest boy ever! He always has a smile on his face! 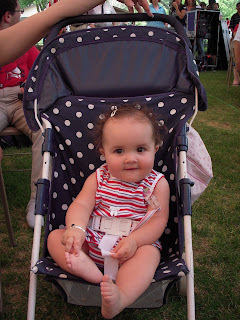 Adie in her cute fourth of July outfit! We spent the Fourth of July in Delta this year. It was so much fun to spend it with Travis's family. Travis and I started the day of by running the 10K with our brother in law Brandon. 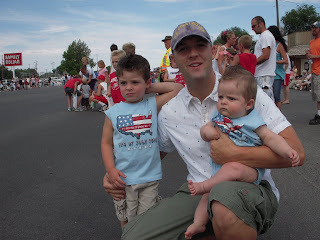 Then we all headed to the parade! 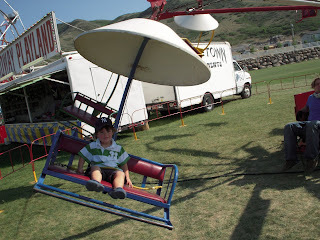 Hudson loved it! He collected a ton of candy! 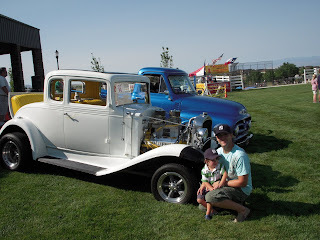 Travis took Hudson to the demolition derby, he loved it. He still talks about the cars crashing. Then we ended the day with doing some fireworks! 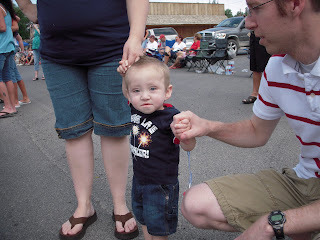 This was the first time Hudson saw some fireworks, we weren't allowed to do them when we lived in California. He loved them! We had a lot of fun, it was nice to be able to spend it with family! Remy is showing more of his personality daily! His new thing is to blow bubbles and make the -th- sound! He is such a pleasant boy and makes us all smile every day! Notice the arm rolls? How many can you count? He still has lots of rolls! I think he has three armpits, but that just might be me! 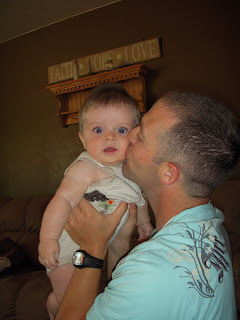 I love how chubby he is I always have to squash him! 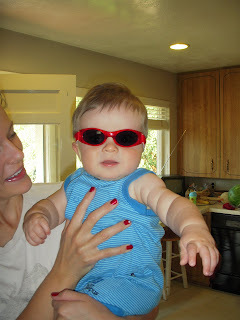 These are his new sunglasses I bought for him so that he won't squint so bad when we go outside. Mister Remy is 6months old, well he was a few weeks ago! He had his 6 month check up on Tuesday and he weighed 19 lbs. He has slown down a bit on his current weight gains. He is Now in the 90Th% instead of 95Th% . He is such a joy to have in our family. He is now rolling over really good back and forth! He also is sitting up really well ,we just need to be with him for a little assistance. Remy is grabbing every thing in his reach now including Hudson's hair! 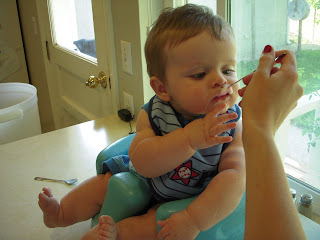 Remy also just started blowing bubbles and his little voice gets cuter every day! Here are a few cute pictures of our cute happy baby boy! We Love you! 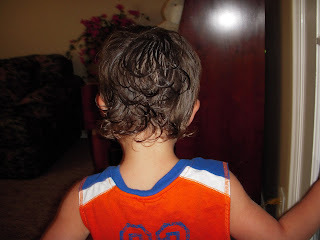 Well Travis had me cut Hudson's hair into a mullet a few days before the Fourth of July, I hated it! 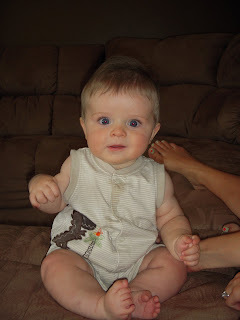 Hudson is sometimes a little trouble maker, but now he looked like one! So after a few days of sporting the mullet I got the okay from Trav to cut it off! 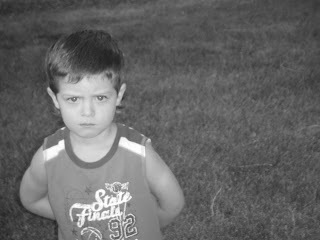 He admitted to not liking it very much either, especially the bad attitude that came with the haircut! 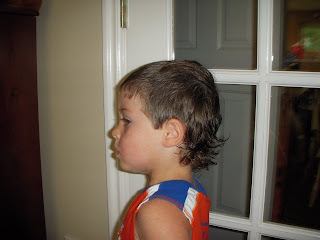 Side shot of the mullet! White trash shirt to go along with the haircut, sorry to anyone who has had a mullet or still does or even likes them! I just don't! This ride was a little to much for Hudson! At first he really liked it but then it got going way to fast and high that even I stared to get nervous for him. It was sad and a little funny at the same time because you could see his facial expression change a littler more each time it got higher. I yelled at the guy running the ride that he was all done, so by the time he finally heard me and stopped the ride Hudson was in tears! 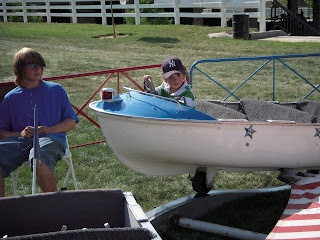 I felt so bad, I should of not let him go on it even thought he wanted to. Hudson is a trouper and many of you now that he has little fear to do stuff. After he got of the ride he was fine and then asked to go back on it again! 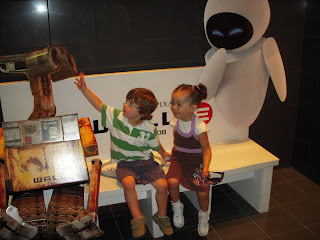 We took Hudson to see Walle in Utah the day that it came out. Aunt Bethany, Uncle Parley and the Juarez' came along with us. 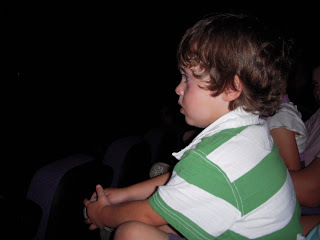 It was Hudson's first time going to see a movie in the theaters. He was so funny to watch he was sucked in! 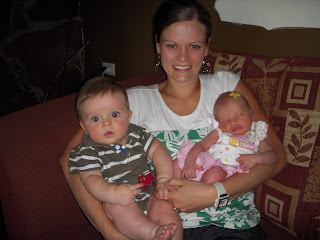 Hudson and Eve! I think he has a crush on her!! 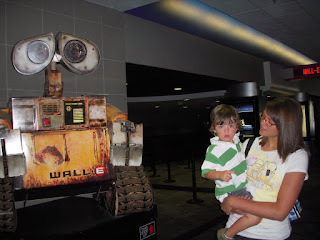 Hudson and Aunt Bethany , he was a little worried about this big Walle! Here is a picture of Hudson glued to the movie. During the movie while Hudson was sucked in I slipped a piece of licorice into his hand. It took him about 10 seconds to realize that he had something in his hand. When he finally realized he had a treat in his had he made the funniest face and was so excited ! It was so funny but I think its one of those moments that you had to be there for! 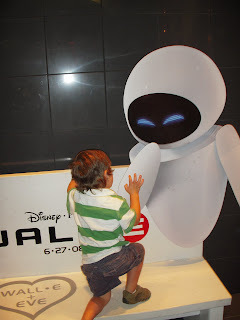 I would have to say the only bad thing about taking Hudson to see a movie is that he kept asking to watch Walle again and it is hard to explain to him that we can't watch it any time like we do when he gets a new movie! 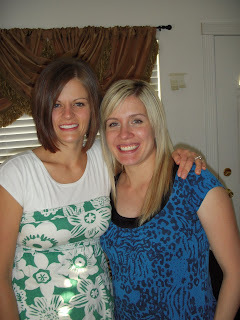 I am so grateful for good friends! 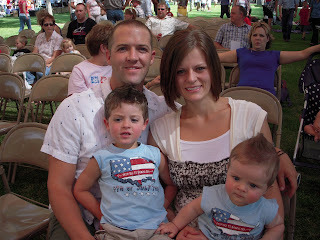 The Juarez's became our good friends when we were living in Utah! We miss them so much! It was so fun to see them while we were visiting. 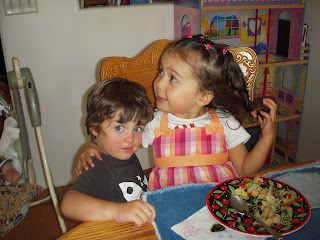 Hudson and Olivia were so good buddies and still are. It is so fun to watch them play they just pick up were they left off. Congrats to them on their Beautiful new baby Girl Viola. 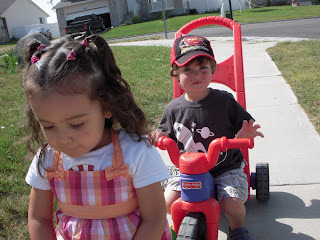 Hudson and Olivia playing outside! They like to give each other hugs! Remy trying out their swing, Olivia got Remy to laugh so hard while we were their! Thanks guys for all the fun days that we got to spend together! We love you guys! 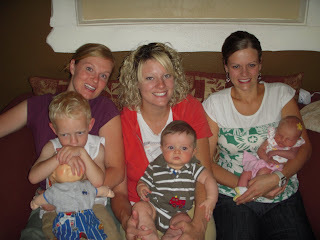 My cousin Sally had her baby the day we fly into Utah so Me and my cousin Jessica went on a rode trip to see them. 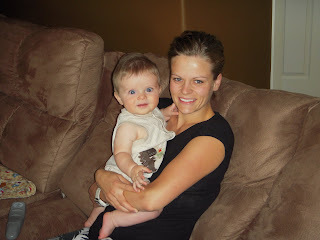 It was fun to cuddle with a baby again since Remy is so big! Congrats she is beautiful! 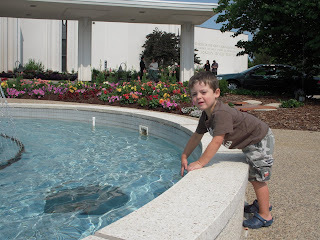 Well I have been a major slacker at the blog since I was on vacation . I have so much to catch up on it will take me a few days. Well I was brave and few to Utah by myself with a three year old and a 5 month old baby! They both did so good. I was so warn out and tired it took me a week to recuperate. When we landed in Utah it was 11:30 pm, which is 1:30 in the morning to us. Hudson was a trouper and other than being really tired and not sleeping at all on the plane he did well. Remy was happy to be on my lap and slept good. My arms were so sore from holding him while he slept! It was a long 11 hour travel day but so very worth it! That first morning that we were in Utah it was in the high 40's. That meant that it was freezing to us. So we bundled up and went outside so Hudson could go ride the four wheeler and tractor that he has been so excited to ride again. 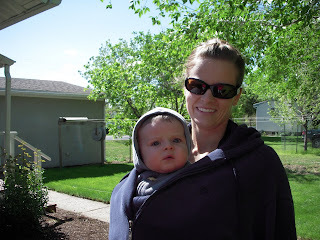 Remy bundled up in the baby carrier then zipped up in my jacket. 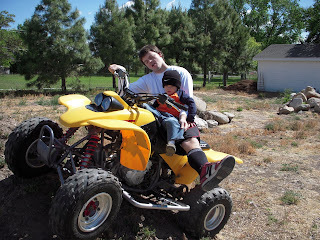 Hudson Riding the yellow four wheeler with Uncle Brady! A big thanks to everyone for all the rides! 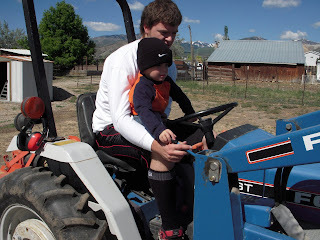 Dumping the bucket on the tractor. 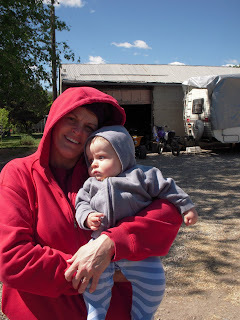 Remy and Grandma Lil ! 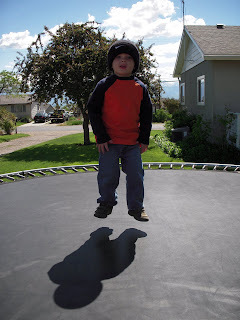 Hudson jumping on the tramp! It is amazing how well his memory is. No matter how long it has been since we have been back to Grandpa's and Grandma's he remembers everything and were it is! 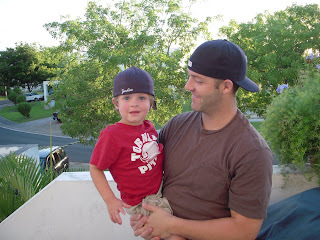 Before we went to Utah Travis went and bought Hudson and him new Yankees hats. I myself don't really care a ton about watching baseball unless it is my Hubby playing or one day maybe Hudson. 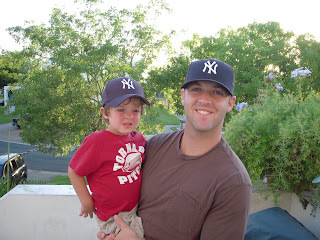 I thought it was cute that Travis wanted some one else in the family to cheer on the Yankees!